Oh, ’tis the season, folks! As we head into the depths of winter, our bodies face the task of fighting off cold and flu germs. The good news is, while our bodies are fighting to protect us, we’re building a stronger immunity for next year. When I catch a cold virus, I use it as an opportunity to pamper my immune system as much as possible. I know that my immune system will be stronger for having fought the virus off. Still, being sick is no fun and the symptoms can make life miserable for days on end. When I feel a cold coming – you know, those first feelings of fatigue and irritability; maybe a full or scratchy sensation in your throat – I employ some natural remedies to help ease the symptoms while my body gets to work fighting the battle and improving its strength. 1. Coconut oil – I eat it by the tablespoon full. Coconut oil has natural virus-busting properties and gives my body a boost in its virus-fighting efforts. 2. Raw, unfiltered honey – This is another wonderful food with virus-fighting properties. I add it to tea or mix it with coconut oil. 3. Warm tea – it soothes my throat and helps me to relax so that I don’t overwork my body while it’s healing. 4. Magnesium – When your body is stressed it rapidly uses up this important nutrient. I take regular epsom salt baths and make use of magnesium oil when I don’t have time to soak. 5. Thieves Essential Oil Blend – Thieves essential oil is a wonderful smelling essential oil blend of Clove, Lemon, Cinnamon, Eucalyptus, and Rosemary essential oils. I diffuse it in my cool mist diffuser, inhale it straight from the bottle and rub it on my hands to keep them fresh and clean. I also use Thieves lozenges to provide comfort when I’m not feeling well. 6. Breath Again Essential Oil Blend – Breath Again, which comes in a handy roll-on tube contains four types of Eucalyptus oil, Bay Leaf essential oil, Rosehip seed oil, Peppermint, Copaiba, Blue Cypress and Myrtle oils. I like to inhale Breath Again straight from the bottle or rub it on my chest and neck when I’m not feeling well. 5. SLEEP – You can’t buy this one, folks. You just gotta do it! I’ve found in the past (before I began using natural remedies, of course) any time I caught a cold, no matter its severity, if I didn’t get enough sleep at the beginning it would turn into bronchitis without fail. Since I’ve begun using natural remedies and making sleep a priority I haven’t been sick with bronchitis. In fact, my body has been able to stop the last few colds at the scratchy-throat stage so that they never turned into a head-clogging, chest-rattling nightmare! 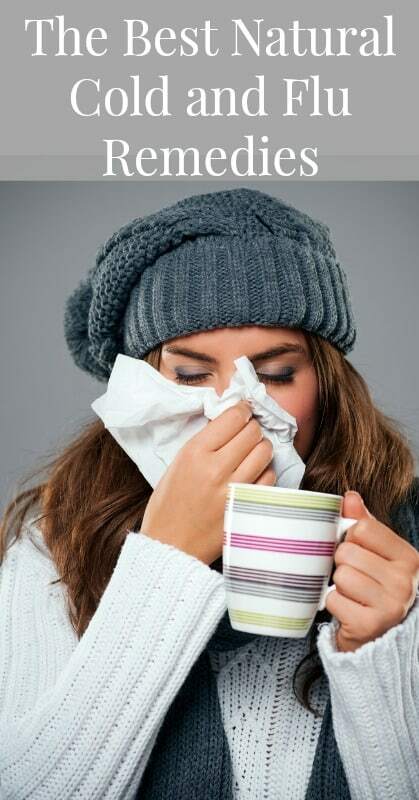 Take these natural cold and flu remedies for yourself or share them with a friend! Let’s stay well this winter and get ourselves better faster when a pesky virus sets up shop in our bodies.